Marrakech is without a doubt one of the most famous and loved cities by tourists in all of Morocco and there are quite simply numerous reasons for this. It has markets, mosques and many hidden streets and places to explore. It is also something of a time warp with its mixture of modern and medieval architecture. One minute you could be walking in a relatively modern part of the city and in a few minutes find yourself in an ancient looking street, filled with medieval buildings and street stalls. It’s exactly this mixture that makes me look forward to holiday rentals in Marrakech and I can never wait to start planning my next adventure. Here are some of the most incredible places that you can visit in this great city. This marketplace square is the lifeblood of Marrakech and you can imagine it would have been since the very early times of the city. The square is a 24 hour affair and by day there are many street vendors and performers (including the snake charmers you see in movies). 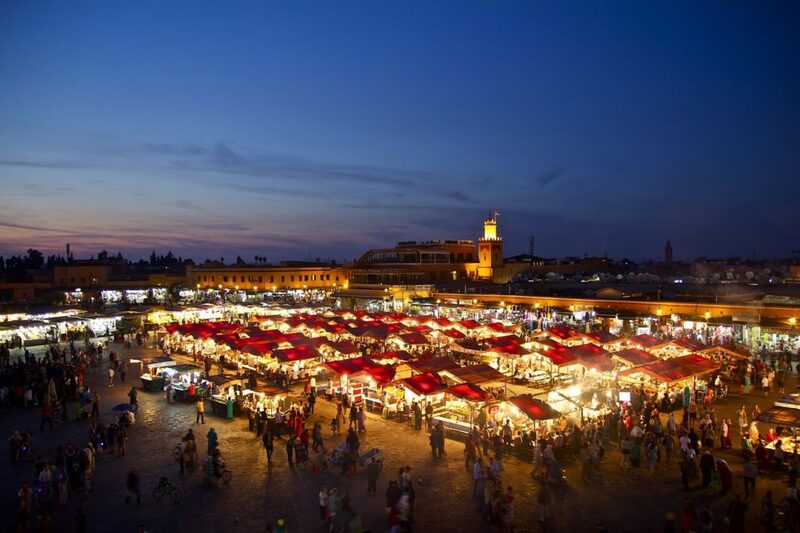 By night the square lights up and transforms into a place where you can get some absolutely delicious Moroccan food. This is also accompanied by the locals playing traditional music and you get the feeling that you could be in Marrakech today or hundreds of years ago, the difference really would not have been so great. If there was only one thing that you could see in Marrakech, this would definitely be it, because it says so much about the city and its history. This is another popular place for tourists to visit and it really isn’t difficult to see why. This is a stunning garden that really is one of a kind. It is a botanical and landscape garden that was painstakingly created by French artist, Jacques Majorelle, over forty long years. The highlight is definitely the mixture of the gardens with palm trees, cacti and water features, along with the cobalt blue villa. The colour of the villa is incredibly deep blue and it stands out . The sights themselves are great, but the villa is also home to the Islamic Art Museum of Marrakech, the Berber Museum and the Yves Saint Laurent museum (as the villa was purchased by the founders of the fashion label Yves Saint Laurent), so there will be something to do for everyone. Hammams are bath houses in the traditional Islamic style and Marrakech is absolutely filled with them. They are typically located near mosques, as they are traditionally used to wash before prayer under Islamic rules. The most exciting part of the hammam in definitely the ritual of bathing, which is probably unlike anything that you have ever experienced before. Generally speaking you start by bathing to clean the body, then you head to the sauna and finish off in an ice cold pool to finish things off. You can also enjoy many different spa treatments, like massages and so on. Hammams are truly refreshing places to visit and are often extremely beautiful places, with mosaic tiles, mood lighting and many other interesting architectural features that truly elevate your normal bathtime. No visit to Marrakech would be complete without visiting a mosque, especially in an Islamic country, where the mosque plays such a huge role in the lives of the people, with prayer occurring five times a day! Koutoubia is definitely the mosque to see. It is the largest in Marrakech and perhaps the most important in the city. As with most mosques, it’s grand and elegant architecture does not disappoint. The 77 metre high minaret was built during the 12th century and rises up high above the mosque. The mosque also has some other notable features, such stunning curved windows, decorative merlons, arches and a plaza with gardens. The mosque is lit up at night and the minaret makes up a unique and beautiful part of the Marrakech skyline. The souks (markets) of Marrakech are some of the most interesting and exciting places to visit. They are an elaborate labyrinth of narrow alleyways that connect together and have a number of different stalls where you can buy more or less anything imaginable. Leather goods, carpets, food and other handcrafted items are sold here, and each section or “street” is dedicated to different items. These markets still operate as though it was hundreds of years ago and are the perfect place to experience Moroccan culture and way of life, as well as getting hands on an amazing souvenir. My tip is the leather goods, these are always exceptionally well made and you can get them for a great price too! They are often very noisy and the sight and senses are overwhelmed by many things, from the smells of fragrant oils and perfumes, to a dazzling array of colours from the leather goods and carpets on sale there. The souks are a great place to enjoy engaging in some haggling with the sellers there. It’s all part of the fun to bargain with the locals and get a good price. One common tactic is walking away from a deal and saying that you will think about the price and come back. The locals all know the trick all too well, but it’s fun anyway to play the game.